Industrial Zoning Cape Town industrial property. Industrial Zoning Cape Town industrial property. Firstly, the industrial areas in Cape Town are primarily designed to accommodate manufacturing and related processes. Ranging from general industrial uses which may have some impact on surrounding areas, to hazardous uses. Also, noxious uses which have a potentially high impact and must be carefully managed. Industrial development has particular requirements for road and waste infrastructure. Industrial-zoned land should be reserved for industrial purposes to optimise this infrastructure and mitigate potential impacts. In the General Industrial Zone, two different subzones accommodate variations of built form. Opportunities are provided for consent uses associated with industrial areas, such as factory shops. In addition, a particular zone is provided for noxious and risk industries. Click here to view the City of Cape Town Zoning Map. The GI zone accommodates all forms of industry, except toxic trade and risk activity. It is accepted that the intensive nature of the industrial activity or the scale of the operation could generate some adverse impact on adjacent properties. As Epping Industria is the most central business location, it fits in very well with the current zoning scheme. 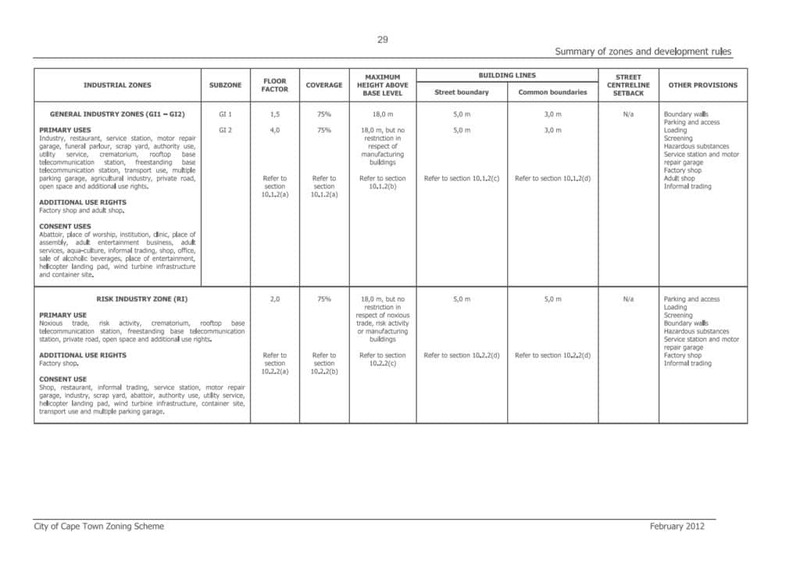 Click here for a full copy of the City of Cape Town Zoning Scheme. (a) Primary uses are industry, restaurant, service station, motor repair garage, funeral parlour, scrap yard, authority use, utility service, crematorium, rooftop base telecommunication station. Freestanding base telecommunication station, transport use, multiple parking garages, agricultural industry, private road, open space and additional use rights as listed in subsection (b). (b) Additional use rights are factory shop and adult shop, subject to the provisions of section 10.1.5 or 10.1.6, whichever is applicable. (c) Consent uses are an abattoir, place of worship, institution, clinic, place of assembly, adult entertainment business, adult services, aquaculture, informal trading. Shop, office, the sale of alcoholic beverages, place of entertainment, helicopter landing pad, wind turbine infrastructure and container site. Floor factor and coverage shall be determined by the following ‘Table of floor factor and coverage in General Industrial Zones’. Epping Industria is the most central business location in Cape Town. Mainly zoned GI 2. (v) Shipping or transport containers, when stored or stacked outside a building, may not extend higher than 15 m above average ground level. The street boundary building line is 5 m, subject to the general building line encroachments in section 18.1. The common boundary building line is 3 m, subject to the general building line encroachments in section 18.1. Where a land unit has a common boundary with another land unit that is not zoned General Industry or Risk Industry, Council may require a 1,8 m high wall to be erected, to its satisfaction, along with the common boundary. Loading bays shall be provided on the land unit by section 19.4. The Council may require screening by section 18.5. Notwithstanding the fact that an activity constitutes a primary use right regarding this zone, no activity or use which includes the on-site storage of hazardous materials shall be permitted. Unless a risk management and prevention plan have been submitted and Council has approved it. The development rules applicable to a service station and automobile repair garage in Local Business Zone 2 shall also apply to a service station and motor repair garage in this zone. (b) any goods offered for sale but not manufactured on the property must be directly connected with the products produced on the property. (d) No form of public address or sound amplification shall be audible from outside the premises. Informal trading only permitted on sites demarcated for informal trading regarding Council’s informal trading by-law.